Shooting, firearms, weapons, tactical stuff. What is the best way to store a handgun? Pretty sure you are overthinking! I know you said you have a safe, but you did not specify the type or model so I'll run through my whole setup. I store mine on its side on a foam pad just for more protection. I don't keep it in a holster because if I need it in an emergency, the gun needs to be easily accessed. Mines loaded with a round in the chamber ready to go at all times. My glock is stored in a biometric quick access safe like this one https://combated.com/best-gun-safe-reviews/#1_vaultek_vt20i_biometric_handgun_safe The thing I like about that safe is that I can move it wherever I feel like I need it at the time. When I'm sleeping, I'll move it to my nightstand near my bed. When I'm in the living room, I can easily move it there. 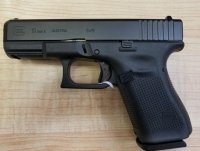 I have let beginners shoot my glock 19 Gen 5 at the range and most of them like it. Some old glock heads argue, but some people prefer the front-strap finger groove gone.